KAYDEN is the mascot of headwear brand KEIOS UNDER THE VEIL. The three-eyed creature is the imaginary friend of Eddi’s young son Jayden. The monster’s original form, designed by Eddi for Jayden. Simple in form, ready to transform into any shape according to Jayden’s current interests. Designed by Chinese artist Bee Wong. First designed and made for KEIOS’s new studio store opening in Shanghai. It was to replace the conventional Fortune Cat people would put for good luck; it personalised the space for the brand by using its own mascot. Three colorways of the sofubi toy were produced; Original, Blue Ice glittered version, and a Rainbow edition. Kids love dinosaurs and Japanese monsters, so it was only fitting that KAYDEN turns himself into a kaiju to earn Jayden’s love. Designed by Bee Wong, KAYJU was released in 3 different sizes; M, L, and XL. The XL was 35cm in height made with polystones. The medium size got a few color treatments, including its Original Edition in Glow-in-Dark, and a clear Cough Syrup Edition launched at DCON 2018. 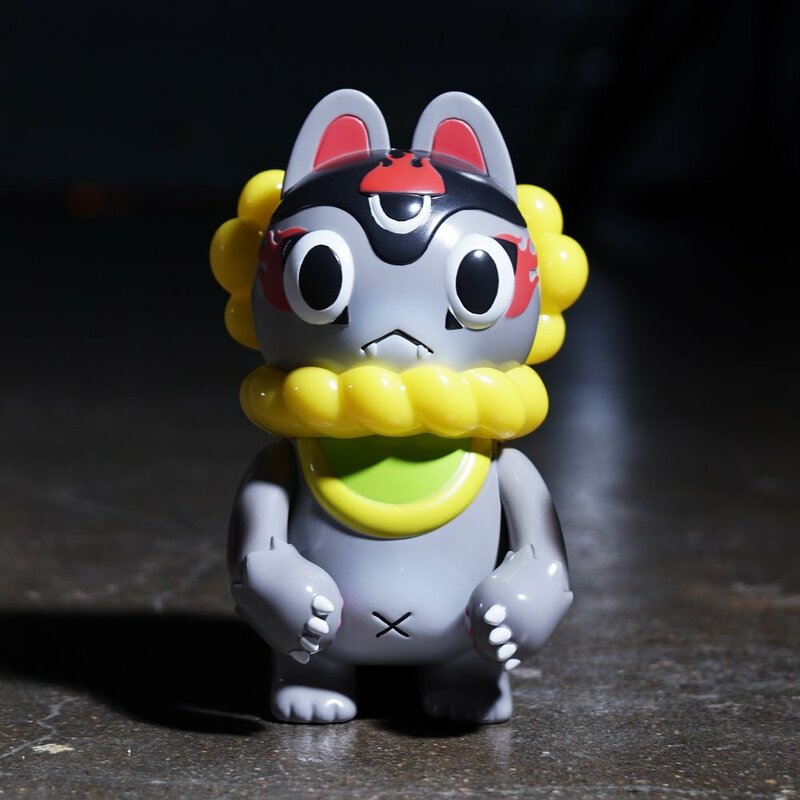 Japanese folk-toy artist, Teresa Chiba, remixed KAYDEN together with her infamous INU-HARIGON character. A collaboration edition with Hong Kong’s MILK Magazine was released along with the Original Edition at ToySoul Hong Kong in the winter of 2018.